For easily printable instructions, see the Candy Sushi Recipe. Note that this recipe creates two “types” of sushi, the maki rolls, and the fish-topped nigiri. You can make both, or choose just one type and omit the instructions for the other. As written, the recipe makes approximately 2 dozen rolls and 2 dozen nigiri. This photo guide will show you how to make both types of candy sushi. Begin by melting 2 tbsp of butter in a large microwave-safe bowl. Once the butter is melted, add 2 cups of miniature marshmallows and microwave until melted, stirring every 30 seconds. 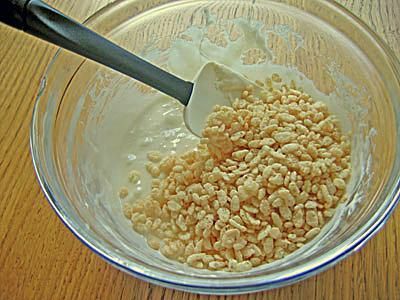 Add 3 cups of crisped rice cereal and stir until fully combined. Line a baking sheet with waxed paper, and spray the paper with nonstick cooking spray. Scrape the hot cereal-and-marshmallow mixture onto the baking sheet. Spray your hands with nonstick cooking spray, and begin to press the candy into the sheet in a thin layer. Begin working from the edge of the shorter side of the sheet. The mixture will only cover approximately half of the baking sheet. Roll the cereal mixture once around the gummy worms, pressing firmly to make a tight roll and to seal the edges together. It is easiest to use the edge of the waxed paper to help you lift the candy and avoid breaking or tearing it. Take a large sharp knife and cut the rolled log away from the rest of the candy mixture. Place it off to the side, and repeat the worms/rolling/cutting procedure for the remainder of the cereal mixture. Using a large sharp knife, slice the logs into 1-inch rounds. Try not to press down very hard, so that they maintain their round shape. If they get deformed, you can roll the pieces between your hands to make them round again. Cut green Fruit Roll-Ups into strips 1-inch high and approximately 3 inches long. (Alternately, green Fruit-By-The-Foot or fruit leather can be used). Wrap each sushi piece in one green strip to complete the rolls. Candy Sushi is not restricted to simple sushi rolls. You can also make fish-topped "nigiri" sushi. To make this type, repeat Step #1 by melting 2 tbsp butter and 2 cups mini marshmallows, and adding 3 cups crisped rice cereal. Press the cereal mixture into the prepared baking sheet, but do not press it as thinly as before. It should be about ¾ inch thick once pressed into the baking sheet. Cut the candy into rectangles about ¾ inch by 1.5 inches. Place a candy fish (such as a Swedish fish) on top of each rectangle. Cut a green Fruit Roll-Up into strips approximately 1/2-inch by 2-inches. 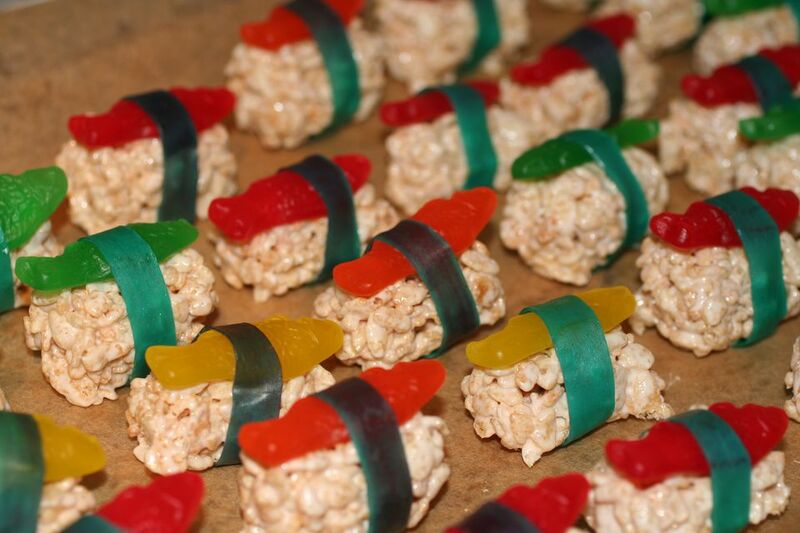 Wrap each fish-and-rice candy with a green strip. Your sushi is now done and ready to eat. For a truly "authentic" presentation, use sweet replacements for traditional sushi accompaniments. Try serving the sushi with chocolate sauce (instead of soy sauce), green-tinted whipped cream or melted white chocolate (instead of wasabi) and thinly sliced pink candy fish (instead of pickled ginger). Note that these candies are best eaten the day they are made, as the fruit wrapping gets sticky if left overnight. Alternately, you can prepare them up until the final step, and wrap them once you are ready to eat them.